Forget that you are admiring a work of contemporary art. Instead imagine that before you is an unearthed artifact, a recently discovered piece of some long-lost civilization. Now let your fanciful thoughts take flight, allowing you to create the historical truth necessary for this object to exist. By doing this, you have become a collaborator with the artist, fleshing out the creator’s own fantastical world as only you uniquely could. And while it is rare for a work of contemporary art to evoke such thoughts, one such piece was displayed in the recent Art Toy Gama curated Forever Toys group exhibition: the Monumento APO Frog sculpture by Korean artist Hyunseung Rim under his twelveDot alias. While one could certainly weave a backstory for twelveDot’s Monumento APO Frog piece without further knowledge of the artist or his work, understanding the history he’s previously created allows for a richer metaphoric tapestry to emerge. The APO Frog creations are the most common manifestation of twelveDot’s long-running Project aftr. art narrative, the core concept behind which is that a manmade apocalypse has occurred, the most fragile creatures in earth’s ecosystem, frogs, having ironically survived by evolving into human-like bipeds. 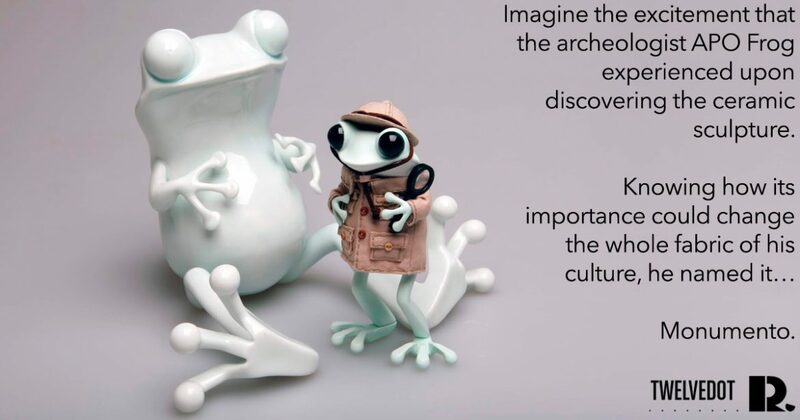 And it is one of these enduring amphibians depicted herein, the hand-painted ABS plastic sculpture’s roughly 5-inch tall form adorned in a custom-tailored jacket with accompanying pith helmet and magnifying glass. But it is not this archaeologist APO Frog that captures the imagination as much as ceramic work it is paired with. Executed by Hyeeun Jung, it is this ceramic rendition of an APO Frog that is the true Monumento, the Spanish word for “monument”. But if this is the remnant of a bygone APO Frog civilization, then how long have the amphibians reigned in this post-apocalyptic world? What year is it exactly? And how can an unearthed artifact appear this pristine? Marvel at this entire work’s subtle beauty, at the simple lines and curves that compose these fluid forms, and ponder the answers for yourself. For while a true antiquarian like Sir Richard Colt Hoare might insist that we “speak from facts [and] not theory”, the works of twelveDot are best appreciated when you explore their fantastical world with him. TwelveDot’s Monumento APO Frog was displayed as part of the Art Toy Gama curated Forever Toys group exhibition, which took place from September 6th until October 20th, 2018 at the Okendo Kultur Centre in San Sebastian, Spain. Click Here to Acquire twelveDot’s unique Monumento APO Frog piece.